Balfour Beatty are rolling out Masternaut’s telematics solution across their power, gas and water fleets. The company have currently fitted 133 vehicles with the technology, with a further 3,900 set to benefit over the coming months. Balfour Beatty’s Driver Risk Management team will analyse the telematics data and drive benefit through customised reporting, league tables, manager training sessions, best practice forums, and on-road coaching for drivers. Adrian Wanford, Fleet Operations Manager at Balfour Beatty Plant & Fleet, said: “Balfour Beatty has employed a driver behaviour telematics system over the last four years to great success, with reduced collision rates, reduced severity of collisions and a general improvement in driving standards all recorded. “The Masternaut system will maintain and continue the journey to improve on the high standards of driver behaviour achieved so far. “The system feeds back performance to the driver real time and reports on trends such as instances of heavy braking, hard acceleration, hard cornering and speeding. “In addition to this the Masternaut system will bring benefits in track and trace functionality, in-cab communications and, with the link into the vehicle management system, accurate fuel management capabilities. 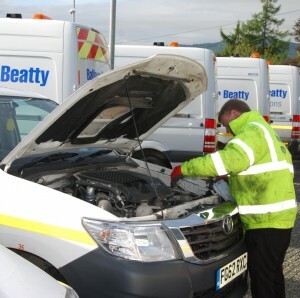 The technology was introduced at a recent safety stand down day in Aviemore, which also saw Balfour Beatty’s fleet team to carry out winter vehicle checks. It involved more than 550 Balfour Beatty employees working on the Beauly to Denny overhead power line project. This project involves constructing 230km of new lines and 500 new towers to carry renewable electricity from Northern Scotland south to the main national grid. With the employees came 133 vehicles in a variety of shapes and sizes, which the company’s technicians subjected to a number of vigorous tests. Portable weighbridges were deployed to check for vehicle weight compliance, followed by safety checks on the condition of tyres, lights mirrors and glass. Mr Wanford added: “It is important that all of our vehicles are in peak condition, but a particular challenge for our team here in Scotland is the often inhospitable weather.